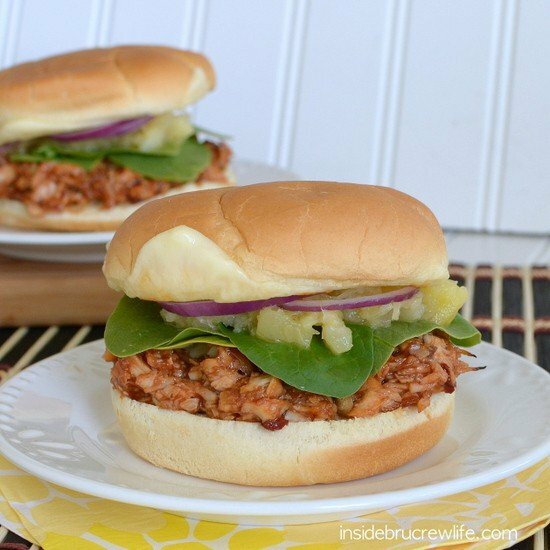 These Chipotle BBQ Chicken Sandwiches are a delicious and easy dinner for when you do not want to be in the kitchen for long. Yesterday we celebrated Father’s Day with my husband. Now, we didn’t do anything extra special. We went to church, had burgers, played ninja, watched tv and ate strawberry pie. and that makes it special no matter what! My husband is the best dad! wants to spend time with our kids. but the man just keeps on loving us! and lets them try to take him down in ninja games. He also will bounce on the trampoline whenever…even when he is dead tired. He is also such a Godly example to our kids (and to me). I am so thankful our kids have such a wonderful father to watch and imitate. Thank you sweetheart for showing us what a true man of God is!!! 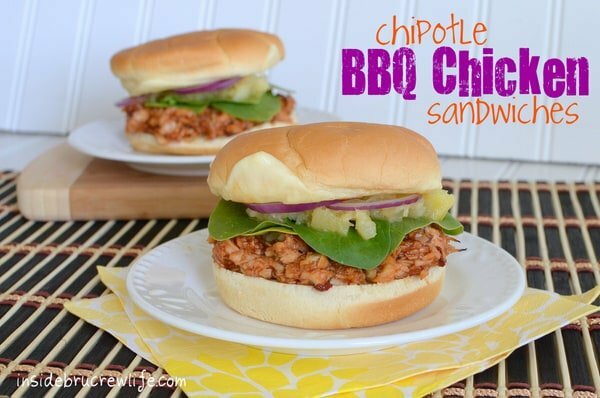 I thought I would share a fun Chipotle BBQ chicken sandwich recipe with you today! pizza, pulled pork, pasta, and of course this chicken. and you can add as little or as many of the peppers and control the heat. We tend to like it spicy so I chopped up 3 for this. The spinach and pineapple will tone down the heat for you! Mix chicken, peppers, and barbecue sauce in a small saucepan and stir over low heat until warm. Place the hamburger buns on a baking sheet. Place the cheese on the bun tops and broil about 1-2 minutes or until melted. 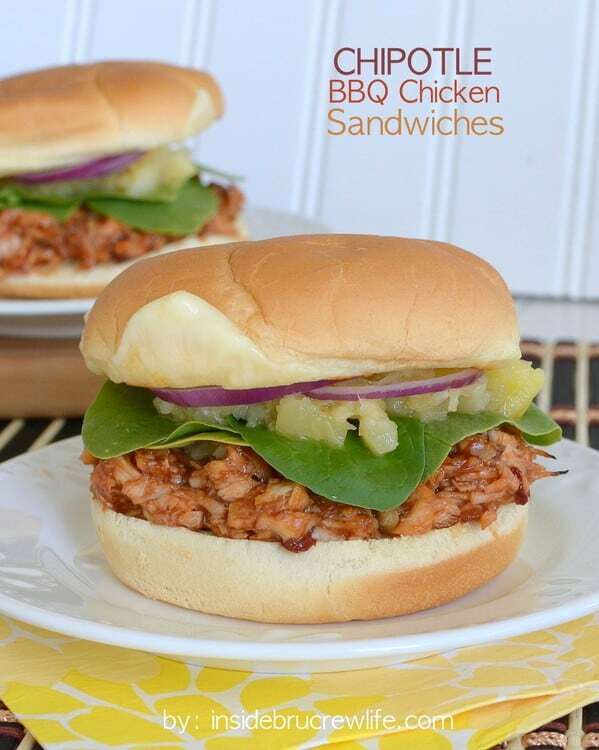 Place a spoonful of chicken on the bottom bun and top with spinach leaves, pineapple, and red onion slices. Serve immediately. Aw, what a great post. It’s so great to read so many about what great husbands we all have. 🙂 These sandwiches…yum. I’m drooling and it’s only 6:30am! Uh, my boyfriend and I live for chipotle-flavored ANYTHING. Like obsessed! These sammies look delish 🙂 so glad you had a fun, relaxing dad’s day with your hubby and kiddos. I bet he loved these! This looks great. 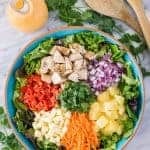 I’m adding it to my menu next week! This looks like my kind of sandwich! Not to mention, simple 🙂 totally making these this week…btw, I have those yellow napkins, hah. Such a great post!! 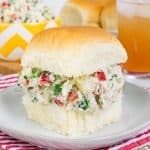 These sandwiches look amazing! 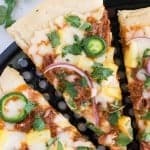 And I’m always looking for dishes to use chipotle peppers in; we’ll have to try this soon (I’ve got an open can sitting in my fridge as we speak). 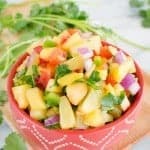 The addition of pineapple is genius! looks yummy. I am a huge fan of dried whole chipolte peppers. I went through a phase where I used them in everything. 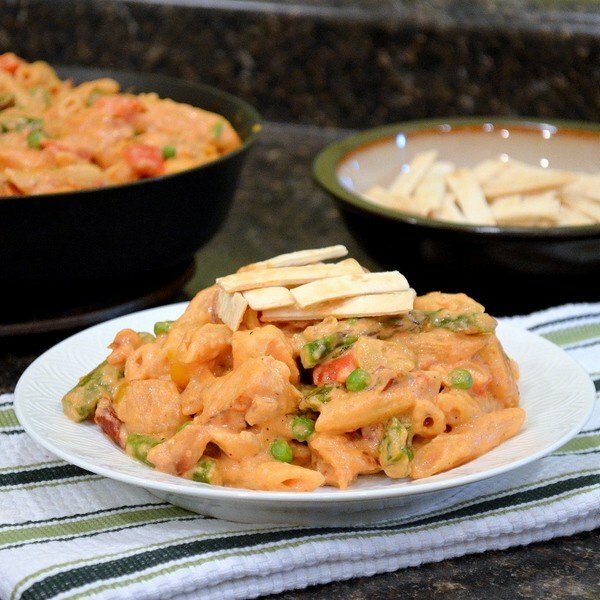 I may have to restart that phase again with this recipe. I LOVE chipotle peppers…definitely one of my favorites! These sandwiches look yummy! 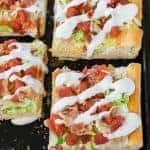 These sandwiches look fantastic! Such a great combination of flavors. Thank you so much for sharing at Thursday’s Treasures! 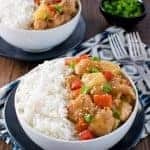 I love when you post recipes like this using already cooked chicken. Makes it perfect for the leftovers!!!! Thanks for sharing! Yum! 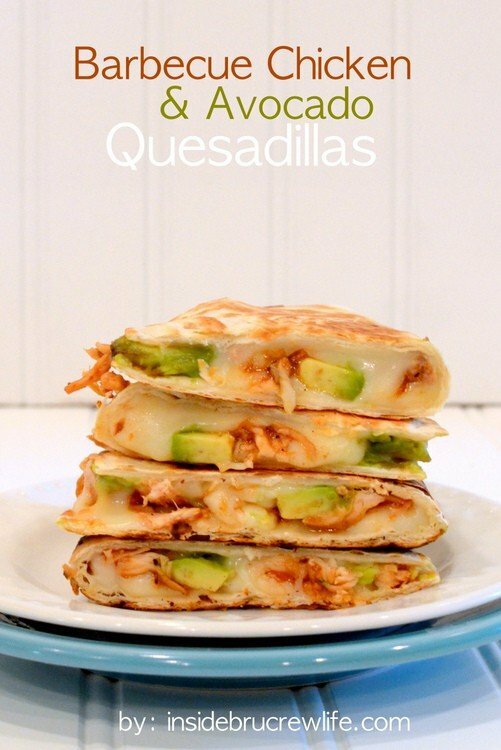 Dinner idea for sure. Jocelyn, it sounds like you guys had a perfectly wonderful Fathers Day and like your husband is a very special guy!